This story is complex in that it involved many people that ultimately loved these foreign, yet American-born, galgos. 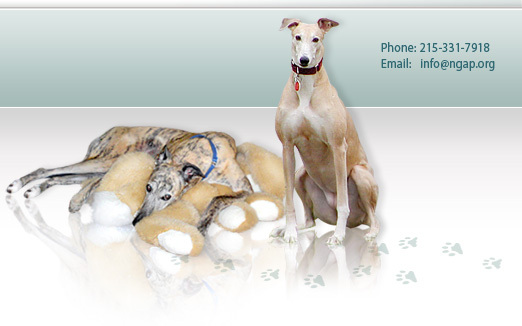 If you didn't know, a galgo is a Spanish greyhound. Used in Spain for hunting, there are no breeding rules and sometimes dogs don't quite fit the mold. The ones that don't fit that mold or are not good at hunting are often left to starve to death or are hung from trees. 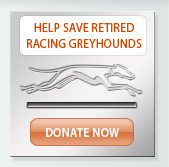 There are now many groups dedicated to save these wonderful animals, just as we crusade for the greyhounds in the United States. 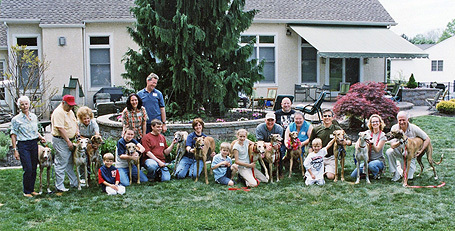 In late 2003, we arranged to bring several galgos from Spain to Philadelphia. It was December and all of the arrangements were set. The dogs arrived at the airport in Madrid, some male and some female. The anxious Spaniards took the dogs to the cargo area for loading and then realized they had left the dogs' passports (vaccination booklets) in a box on top of their lorry. They rushed back to retrieve them, but alas, just like in so many other places, the box was gone. The dogs could not fly and were therefore sent to a kenneling facility in Madrid until new paperwork could be generated. During this holding time, there was a romantic interlude between two of the galgos. When the dogs finally shipped in January, we were told that there was a possibility that one of the females, who we later named Love, might be carrying puppies. We said if that was true, we would let the dog go to term and have her Spanish-American puppies. Over the next few months, our staff veterinarians, the Patels, kept saying that Love was experiencing a 'false pregnancy' and we need not worry about it. We still decided to wait to do surgery on her to see what would happen. Well, as it turns out, Love WAS pregnant. She delivered thirteen healthy puppies. After their first week of care, my wife, who had been visiting the puppies every day, decided that they would be better off being raised in our home, and so they were transferred to Churchville, PA to our large unfinished basement. A whelping box was constructed and a human bed was moved to the basement for my wife where she took up residence for the next few months, hardly coming up to see the light of day. Very early on it was determined that some puppies were weaker and some were stronger, so a second whelping box was made and the six weaker were put in one and the seven strongest were put in the other. That way we could arrange for the weaker puppies to see their mother more often. The process worked well. One puppy in particular always seemed to be crying, so we named him Squeaky. He appeared to be smaller than the rest and so received much more attention because we felt he would fail otherwise. As time passed, the puppies were climbing out of the whelping boxes and needed to run around more. We divided my basement into two sections and the dogs were split up to the left and right sides. Love would often come upstairs just to have a rest break from them more often than Gerda! We began weaning them as soon as possible and putting them on oatmeal and puppy formula. They thrived. We purchased the formula wholesale but still managed to spend $600 during the weaning process. Then of course there's the 'back' story to it all. The back story at that time was that my back was shot. I was in the process of getting epidurals in my back so that I could tolerate the pain. Subsequently, I was not much help. I was able to get an extra epidural so I could picket outside of the Animal Medical Center in New York to free their blood donor greyhounds. It took four years, but mission accomplished! After the demonstration at AMC, I had my spinal fusion. Eventually it was deemed that these puppies could see the light of day. I have a large backyard so we took plastic fencing and cordoned off a section for them to run and play. In the beginning, all of the puppies had to be carried up and down the steps. This was a chore in itself! Even when it was possible for the puppies to run up and down the stairs they didn't always want to do that. It is also appropriate to interject that much of this could not have been done without the help of our faithful volunteers and friends, Tony and Gale Tereszcuk, who came on so many occasions to relieve Gerda so she could go upstairs and sleep in her own bed and help us with whatever we needed. Our little puppy, Squeaky, was the first to do everything; the first to run up the long steps, the first to run down, the first to sneak under the fence so we had to build another fence, the first to jump on the ledge and scare us half to death. As he grew older and stronger, we knew that Squeaky was no longer an appropriate name. He was the boss. We renamed him Chase. While all of the other puppies were adopted out, we kept Chase because, despite being fearless, he had undeniable health issues. Unfortunately, along with all of his other firsts, Chase was the first to leave us. We feared he would not live long and we were correct. At 18 months, Chase died of kidney failure. The day he was sent on to a better place, Chase ran in my backyard like a true thoroughbred. He weighed over 80lbs and was strong and confident. Shortly before Chase passed on, Tye, one of the other puppies was returned. Chase and Tye would always play together. Chase was the alpha dog and sometimes Tye would hide behind the outdoor furniture. Chase was always doted on by my wife and he loved to sleep under the covers at my her feet. He did that every night. The day that Chase died, something truly incredible happened. Tye got under the blankets, of his own volition, and slept where Chase would always sleep. He did that for quite some time. All of the Galgo puppies were ultimately adopted, some even in pairs. Love, their mother, was adopted by Jack and Mary Jo Bucceri, who loved her as much as we did. Most of them returned home for a one year reunion to our home. It was a wonderful day to see them all fully grown and frolicking together. Eight of the thirteen came back to us when they were near death. 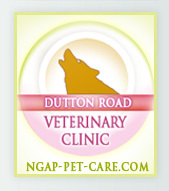 Some were euthanized in our home where they were raised, two were euthanized at the same time and cremated together. Love died March 9, 2009. Tye passed on a few years ago at just under the age of nine. At that point, there were only two surviving puppies; Gaspar, who was originally adopted with Tye and returned to us after seven years when the owner died, and Blaze whose original name was Wolfy. Gaspar just left us. He was eating, drinking, peeing, pooping and enjoying life up until the last days. But sadly, he had developed a significant limp. Although we could never find osteosarcoma in spite of taking numerous x-rays, he had all of the clinical signs. 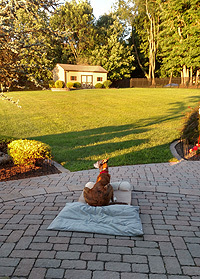 He loved to lay outside of our bedroom, and watch the deer that passed in the woods near us, no longer running after them. That was his favorite place. He did run a little the day before we sent him on when he went to greet his buddy, Emma, at the fence for the last time. We miss him. We miss them all. Blaze is now the last surviving member of the litter. He lives in Chambersburg, PA and is still doing pretty well.